Prodded by Scoutmaster Jerry’s post “So what’s in my backpack?”, here is what I carried on our eight-day trek in the Hoover and Emigrant. 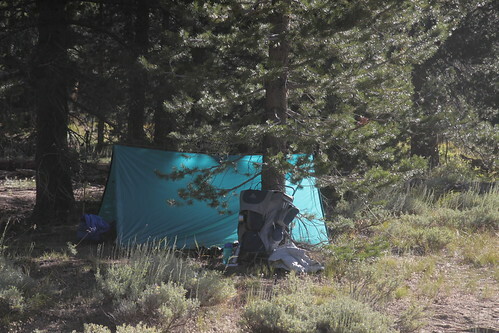 My base weight (not counting food and water) is on the lightweight side at under 25 pounds, but with at least five pounds of gear that other people might not bring, mostly the camera and Crazy Creek chair. 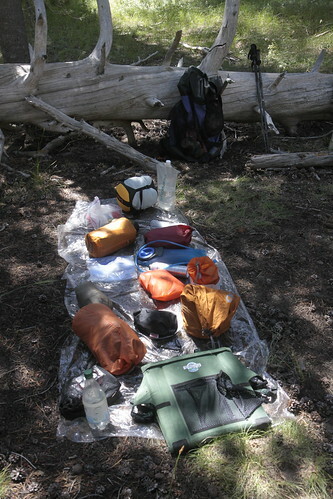 I’ll list the gear by category in decreasing order of weight, but first, a photo of everything that went into my pack laid out on my groundsheet, taken on day 7 of the trek. Now, everything packed, but before I clip the Crazy Creek chair onto the back. I carried some crew gear, but that varied day-to-day. Usually one or two fuel canisters and/or a stove. Call it two pounds. Food: 10 pounds. The common food for our 8-day trek was 7 pounds per person. 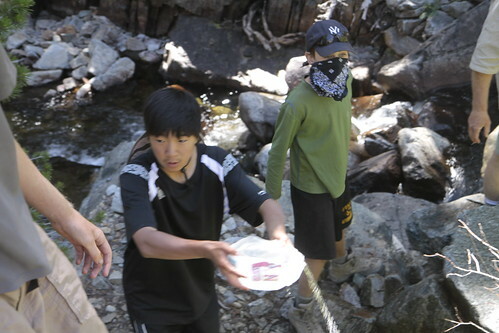 We required each person to bring 3 pounds of their own choice of trail food. 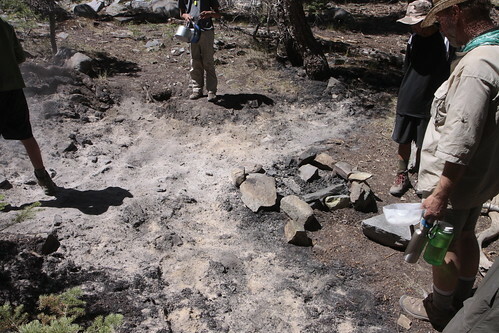 The weight requirement was based on NOLS recommendations (see NOLS Cookery) and was pretty close, with maybe a half-pound safety margin. 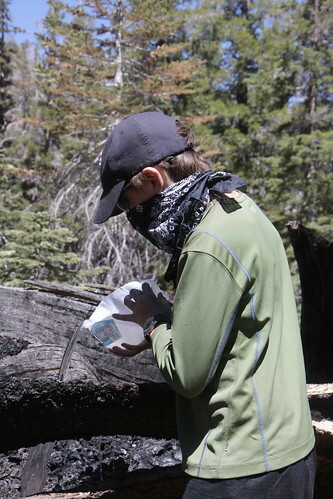 Used a heavy-duty stuff sack, 50 feet of line, and a tiny S-biner for the PCT bear bag hang. Water: 5 pounds (typical). 12 oz. of gear, plus 2l of water. The Platypus reservoirs were for treating extra water and storing extra for cooking. Quite handy, but you can’t fill them from a lake, they just stay flat when you put them in the water. We used the Calistoga bottle or the milk jug basin to fill them. The Calistoga bottle was also useful for treating an additional liter mid-day. The Aqua Mira drops sound fussy, but were a delight to use. You mix drops form the two solutions then let them sit for 5 minutes, then add them to the dirty water, then wait 15 minutes. It always takes five or more minutes to fill the water bottles, so mix, then fill, then treat, then go do something else. Also about 4X to 5X cheaper than Katadyn Micropur tablets. One limitation, you need to mix separately for each bottle and the kit only includes on mixing cup. We brought all our cough syrup measuring cups from the back of the bathroom drawer, so we could treat water bottles and hydration system for a dozen people in one shot. Sleeping: 4 pounds. 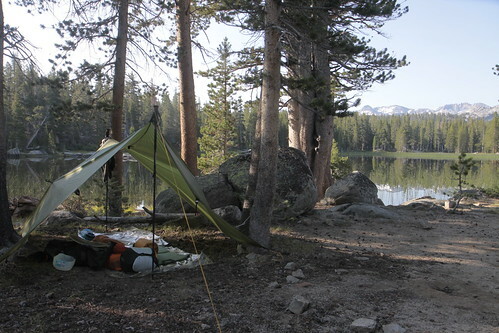 My sleeping gear is the heaviest category in my base weight, but I’ve tried lighter pads (borrowed my son’s Z-Rest, tried a Gossamer Gear TorsoLite) and they just were not as comfortable as my full-length not-quite-the-lightest model of Therm-a-Rest. I love this sleeping bag. It is really expensive, but it is light and I totally trust it. 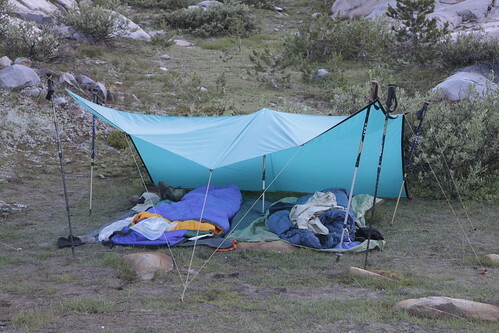 On our coldest night (30º), I slept without a tarp, only the bivy, and never closed up the hood. I took off my fleece cap in the early morning because I was too warm. Essentials: 4 pounds. All that little stuff, mostly the ten essentials, but I put the raingear, extra food, and insulation in other groups. The mountain men called this a “possibles pouch” because it was the stuff you might possibly need. That might be a more accurate term than “essentials”. Camera: 3.5 pounds. Most people could cut a lot of weight out of this area, but I’m just not satisfied with the results of small digital sensors. It was worth it to me, check out the results and decide for yourself. Clothes: 3 pounds. I threw in the PrimaLoft vest after the last shakedown because my pillow was too small with just the fleece. Stuffing the vest in there made it the right size. The vest was also an emergency extra layer for me or anyone else (Scoutmaster habits die hard). The nights were a lot colder than expected (down to 30º), so I wore it around camp. The long underwear are used as PJs. Pack: 2 pounds. 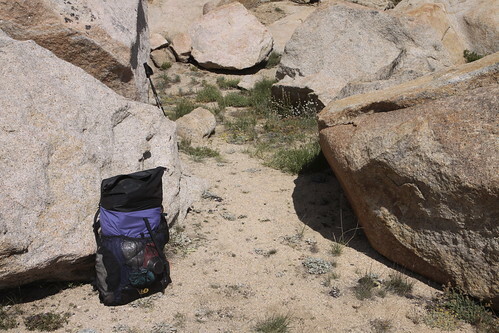 My pack is a Starlite from Six Moon Designs. It was completely stuffed at the beginning and not especially comfortable over 35 pounds (its advertised upper limit), but was just fine from the 3rd day on. My good ol’ Lowe Expedition carries weight better, but it weighs 6 pounds and carries almost twice as much (95l instead of 55l in the main bag). Not really worth it. Shelter: 2 pounds. I would have shared the one-pound tarp, but my tarp buddy walked out with our AMS victim on the first day. 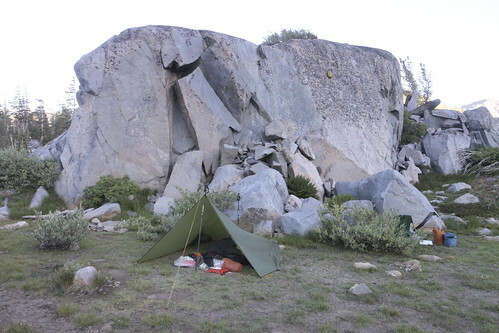 Dang, I had a big tarp all to myself. The grip clips were another last minute addition and were a good idea. These are a modern, much improved version of the old Visclamp, just right for adding side tie-outs to a tarp pitched as an A-frame. Hint: attach them before you pitch the tarp or get a friend to help. 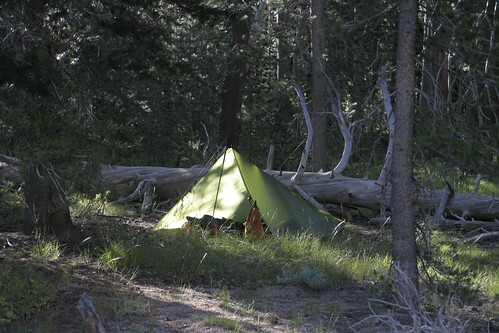 The Ptarmigan bivy is from Titanium Goat (love the name). It has a breathable, tightly-woven nylon top with a DWR finish to repel water. I rarely zip it all the way up. I mostly duck under the the hood to dodge the gentle nighttime breeze that steals so much warmth. Luxury: 1.5 pounds. My Crazy Creek chair. 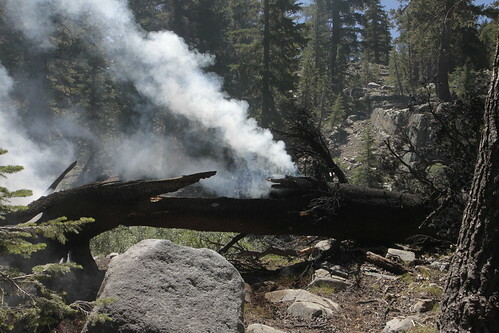 Even when I was a kid, the one thing I really missed in the backcountry was a place to sit down and lean back. 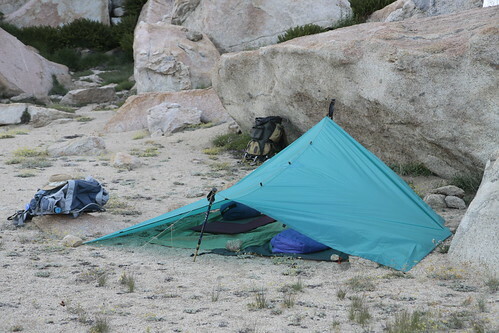 This isn’t light, but I tried the Crazy Creek Hexalight (half the weight) and stays busted through the fabric after three days at summer camp. Wasn’t as comfortable either. The padding on the original chair is stiff enough to turn a pointy rock into a sittable spot. It also does a good job of leveling out your sleeping spot when slipped under my Therm-a-Rest. It doesn’t fit in my pack, not even the Lowe, but works fine clipped on the back. Reading material: 1 pound. OK, maybe should be in Luxury, but I carried a paperback SF/Fantasy book (Crystal Rain by Tobias Buckell) and poetry (Mountains and Rivers without End by Gary Snyder), both in a small dry sack that I got for Christmas (thanks Mike!). Raingear: 13 oz. Includes a windshirt that repels light rain and breathes a lot better than raingear. 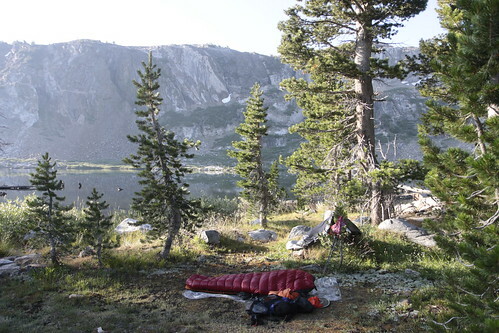 The windshirt was perfect for lunch stops above treeline and the very windy campsite at Bonnie Lake. My Tilley LTM6 hat rounds out the raingear, but that was worn, not carried. Kitchen: 4 oz. This would be lighter, but the Sierra Club cup is just right for tea. Body Glide would have helped when I had some chafing. Some plastic to hang over the camera when it rained. A bright laser pointer would have been really useful for pointing out constellations on those clear nights. I would have used a timer for my SLR to take 30 minute exposures of the Perseid meteors (but I ain’t payin’ $150 for a Canon TC80N3, geez). I might have used sandals or water shoes for river crossings, it took a bit took long for my trail runners to dry out. Luckily, we only had two soak-your-shoes crossings. 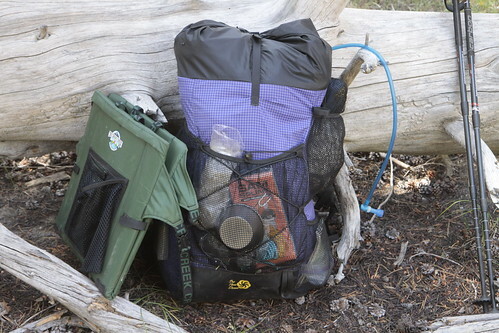 I take very similar gear on a weekend campout, with the addition of a small aluminum kettle, a Super Cat stove, windscreen, and some alcohol fuel. That is enough to rehydrate food or make tea.